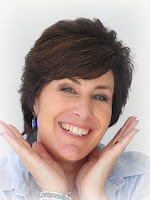 If you've ever experienced that dreadful moment when your store bought jewellery has fallen apart and beads have scattered across the floor, then today's post is just for you. Let's take a look at the humble jump ring and how a simple trick will help you make (or repair!) jewellery so that it doesn't fall apart. But firstly, what's the most common reason that jewellery falls apart? Well, it's often a poorly closed jump ring! Jump rings hold your jewellery together so it makes sense to pay special attention to them. When you purchase round jump rings, they need to be, well...... round! Mis-shapen jump rings will not close tightly and therefore won't make your jewellery secure. So you need to find a good supplier. And you might need to pay a little more for them. 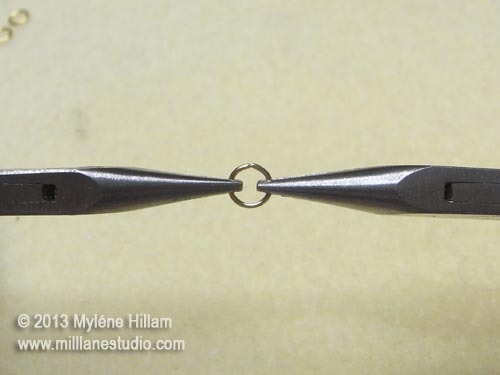 I usually use Beadalon jump rings because I've found them to be consistently round-shaped. Another option is to make your own. You can see how to do that here. The first thing you'll need are two pairs of chain nose pliers. Or one pair of pliers and a jump ring open/close tool that fits on your finger. I prefer to use two pairs of chain nose pliers. 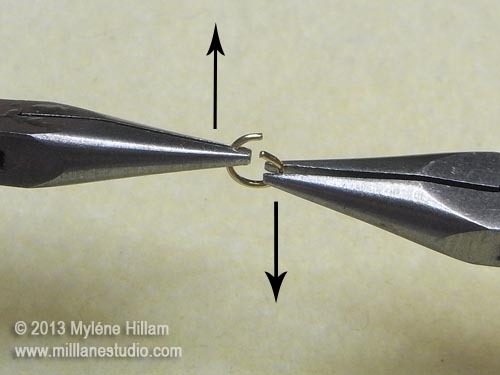 To open a jump ring, with pair of pliers in each hand, grip the jump ring with the opening facing upwards. When you hold the jump ring, use the numbers around a clock to guide you - hold the jump ring somewhere between the 9 and 10 in your left hand and the 2 and 3 in your right hand. Pull one hand towards you and one hand away from you. This keeps the jump ring in it's circular, but open shape. 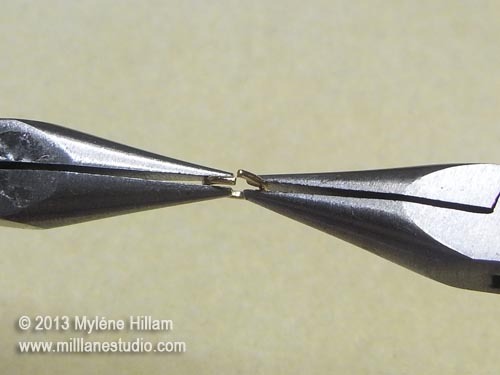 To close the jump ring you will do the opposite action but as you are closing the jump ring you will use a small amount of inwards pressure to push the two open ends together slightly as they pass each other in the centre. Continue a little past the centre and then back towards the centre again. 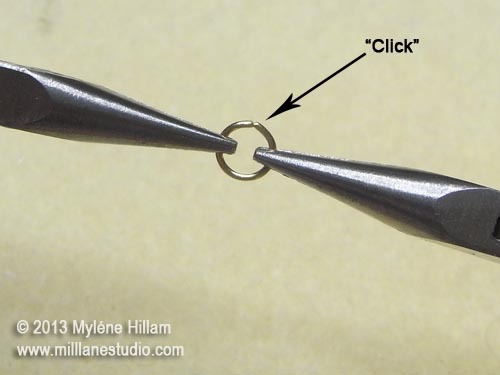 You will hear a "click" as you bring them back together indicating that the jump ring is properly tensioned. When you hear that click you can be sure that you're jump ring is closed and no matter how fine the chain or other connecting links are, they will not fall off. Now test it. You shouldn't be able to get your finger nail in that gap. In fact, there shouldn't be a gap! Now this is not a special jump ring. It is just a well formed jump ring. If you don't hear the click then you might feel the metal grinding as it passes the centre instead. That's OK too because you'll notice that you can't see a gap between the two ends. With practice, you will hear the click. So now that you know how to open and close jump rings properly, you'll be able to fix all those jewellery pieces that have fallen apart. If you want to hear the "click", watch this short video on how to open and close jump rings. 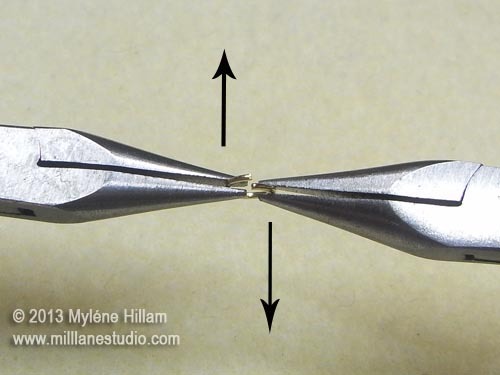 In my next post, we're going to look at another way of connecting components together: making loops on eye pins and head pins.